In this corner, the computer: dynamic, networked. In this corner, the trained human musician: still, in fact, very much able to read scores. Combining those two technologies – human and machine – has been surprisingly limited. Live-coders can send patterns and melodies to musicians. 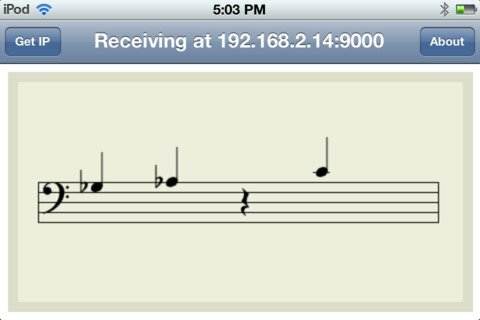 Composers can create pattern based music and use a notation server to send patterns to musician (think of Riley’s In C). Musicians could use OSCNotation to perform works that require random selection of passages. I think it suggests some nice possibilities, and I don’t see why centuries of learned notational convention need to be discarded just because we now have computers. Putting the two together could be really powerful. It’s not a new idea – I recall a Morton Subotnick piece from years ago that used the same concept, though I unfortunately don’t recall the title of that work. (Anyone?) But, of course, ubiquitous mobile computing means what was once confined to big, heavy computers and academic research is now literally in everyone’s hands. The sorts of people with imaginative thoughts on how to use this tend to read this site, so, I humbly submit to your fancies. Let us know if this inspires you in your own projects. By the way, notation too boring? The same developer has made an app that combines OSC with the game of Breakout.